Indian cuisine complemented by a wine list full of surprises. 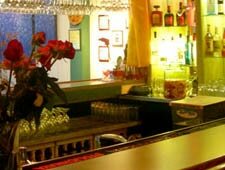 : Ambrosia is ideal for a relaxed dinner out or a visit to the lunch buffet. Just be forewarned: when they say the buffet ends at 2:30, they mean it. Sample one of a laundry list of cocktails or order a bottle of Dom Perignon --- the wine list is full of surprises. Ambrosia calls what they do “Indian Frontier Cuisine.” Translation: authentic, regional flavors influenced by the likes of Mughal emperors and southern fishermen. If your idea of Indian food is limited to curries, try the butter chicken, it's tandoori roasted and served in a creamy tomato sauce. There is a notable selection of vegan dishes as well, including a savory chana masala (chickpeas masala) with chickpeas that are delightfully al dente and the sauce rich and savory with layers of flavor.